There are many ways to adapt your existing conservatory to make the space more usable and efficient. Traditional conservatories aren’t used all year round due to being too cold in winter, too hot and bright in summer, and too noisy when it rains. As a result, the conservatory regularly becomes a dumping ground, home to the exercise bike and clothes maiden! If your conservatory has a traditional glass or polycarbonate roof, you can significantly improve the usability of the space by replacing it with the Leka roof system. It’s highly likely that your conservatory is cold in the winter, too hot and bright in the summer, and too noisy when it rains. The Leka roof is a solid but lightweight system that removes all those problems. The Leka system is new to the market and Pure is one of few fully trained and accredited installers in the North West. For more information about roof replacement see here. If your glazing units are blown (cloudy), they aren’t great to look at and won’t be very efficient either. We can replace them with new units that are more efficient and can match the existing design or be completely different e.g. you can replace leaded units for plain units to modernise the look of your conservatory. It is possible to change the walls of your conservatory to make the space more modern and usable. Traditional conservatories are built using dwarf walls with the units above. However, providing your walls don’t exceed 50% glass you can make changes. We can adapt your conservatory to have a combination of glazing and full height solid walls. This can allow you to install wall mounted heaters, a television or projector screen, art or even a log burner. We may also be able to adapt the size and shape of your conservatory. 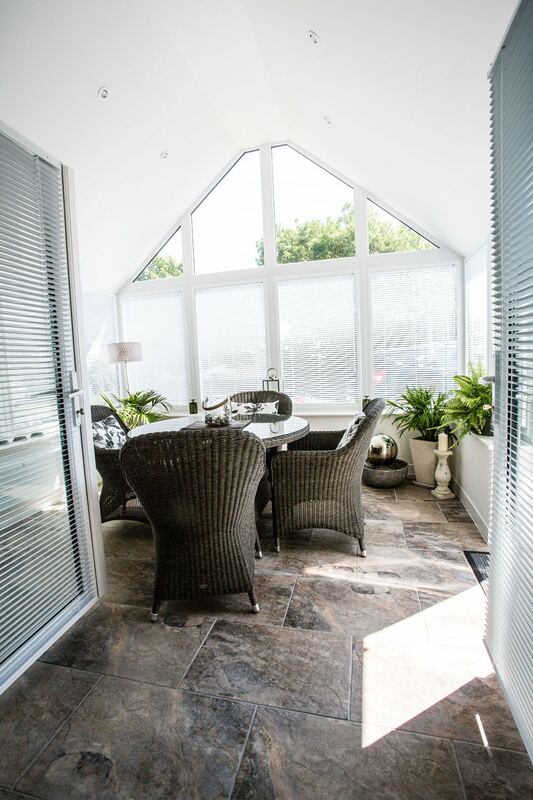 Traditionally conservatories are heated with plugged in electric units or an underfloor system as regulations do not allow the conservatory to be connected to a central heating system. We can install a new a variety of heating solutions to modernise the space and make heating it more efficient. We can install wall-mounted electric heaters, electric fires and log burners. If you’d like to ensure you still have a good amount of natural light coming in to your conservatory we can install roof lights for you. Alternatively we offer a range of electric lighting solutions. Most customers choose low energy LED spot lighting which can be installed with dimming facilities. We’re pleased to offer a new mood lighting system which is low energy strip lighting which gives a soft glow. If you’d like a more traditional, central light point we can fit this too. To book a no-obligation on-site visit, please call 0151 327 8095 or send us a message below.